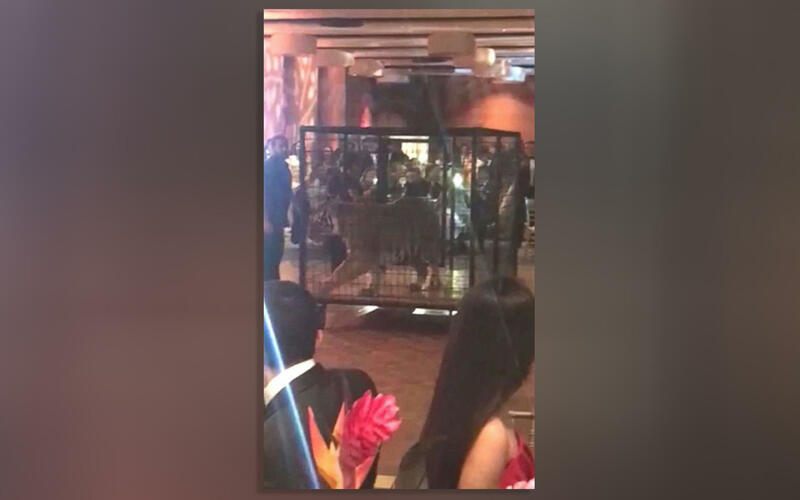 MIAMI -- Some parents and students are outraged after organizers of a Miami high school prom featured a caged tiger for its jungle theme. The caged animal's presence angered some who called it animal abuse for the sake of entertainment, CBS Miami reports. The Christopher Columbus High School prom took place Friday night at the DoubleTree by Hilton Hotel Miami Airport and Convention Center. The sister of one student posted video of the event on Facebook and called the decision "shameful." She told CBS Miami that she and her family are longtime animal rights activists who consider the act animal abuse. They said the entire act was done in poor taste. "Tigers are wild animals. They don't need to be displayed as objects for our amusement. They don't like the fire, the cages, the music, the teenagers with the cameras, they didn't ask for that, they don't have voices," she said. Officials at the high school responded in a statement saying the tiger and several other animals were in a "very controlled situation." They said two area police officers were present during the event. "The animals were provided by facilities that are licensed by the Florida Fish and Wildlife Conservation Commission. The tiger, which was displayed for a few minutes in a cage was never harmed or in danger, was not forced to perform, was always accompanied by his handlers, and for the great majority of the time was lying down in a relaxed state facing away from the audience," the school said. CBS Miami writes that the school said the hotel approved the tiger's appearance.